When trying to optimise my battery draw from my moteino stack, I only want to utilize the Powershields voltage divider to measure the battery level. for the R1, is it just a matter of cutting the trace on the back? or can there be addtional saving with desolders the mostfet and smd resistors? 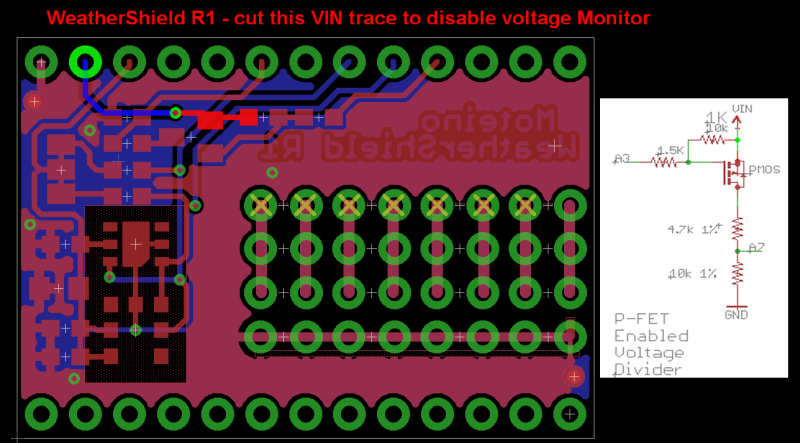 On WS R2, disconnecting A7 is easy through the jumper, but you'd also want to disconnect VIN from that divider to stop the ~2uA current flowing through it - if you remove the angled resistor that is sufficient (no trace cutting). On R1 you'd need to cut the VIN trace and perhaps A7/A3 as well. If you want to avoid cutting the A3 trace, you can leave it disconnected from the rest of the boards (remove that pin from the header) or pull it LOW in your code (in this case make sure to remove the VIN connection). For VIN you could remove the 10K resistor.